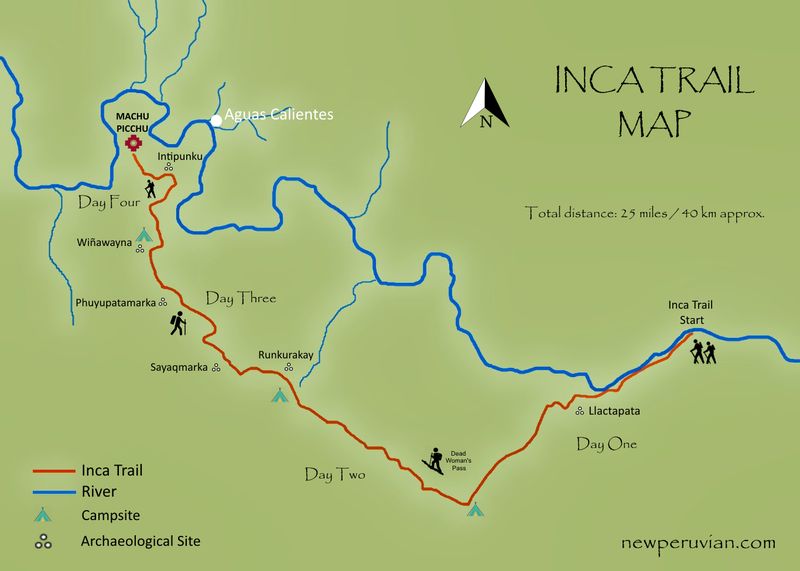 The Inca Trail map above shows the approximate course of the classic four day/three night Inca Trail trek, as well as the Urubamba River and some of its tributaries. Day One: Setting off along the Inca Trail, you’ll have a fairly easy trek to the first main archaeological site, Llactapata. You then carry on until you reach the first campsite, typically at Wayllabamba. The first day is a good warm up for Day Two, which is the toughest day of the whole trek. Day Two: On the second day you have to take on the ominous Dead Woman’s Pass (Warmiwañusca), which takes you over the highest point on the Inca Trail. For most trekkers, this is the biggest single challenge of the trek. Get this out the way, and you know you can conquer the rest of the Inca Trail. After the pass you’ll head downhill to your campsite, normally at Pacaymayo, for a well-earned rest. Day Three: A lengthy trek of ups and downs, but nothing as brutal as Dead Woman’s Pass. The third day is full of stunning scenery and a handful of archaeological sites, including Runkurakay, Sayaqmarka and Phuyupatamarka, all of which you’ll have some time to explore. You’ll then head downhill to the Wiñaywayna campiste. If you’ve got some gas left in the tank, you can walk an extra 30 minutes to the archaeological site of Wiñaywayna before settling down at the campsite. Day Four: An early morning start for the shortest section of the trail, giving you plenty of time to explore Machu Picchu. But first you’ll trek to Intipunku — the Sun Gate — to watch the sun rise up over the mountains (if you’re early enough). It’s not a proper sunrise over Machu Picchu, but impressive nonetheless. Then it’s on to Machu Picchu and the end of your trek. The Inca Trail elevation profile above shows approximate altitudes along the trail. 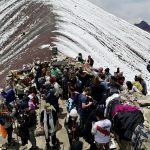 As you can clearly see, the second day of the trek has the greatest altitude gain, rising up from about 9,800 feet (3,000 m) to 13,780 feet (4,200 m) as you traverse Dead Woman’s Pass. Day three and day four of the Inca Trail see an overall descent as you head down to the archaeological site of Machu Picchu. At 7,972 feet (2,430 m) above sea level, Machu Picchu sits at a lower altitude than almost all points along the Inca Trail. You can read more about Machu Picchu’s altitude and altitude sickness prevention here.